Let dough rest for 30 – 60 minutes. Scoop out tablespoons of dough; if using a 1 Tbsp. (size 60) scoop, fill scoop with dough, then level off. Form dough into balls and then flatten slightly to form small patties. Let rest for 30 minutes. 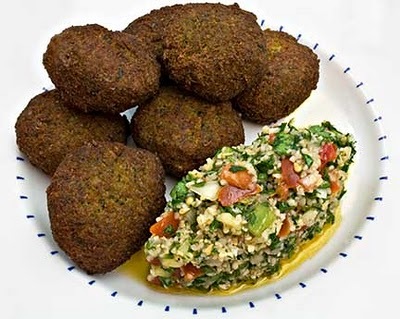 (Falafel may be made ahead to this point). Heat oil to 350°F. Fry falafel in four batches, turning them over when half done, until they’re golden brown (if you put too many in pan at one time, the oil’s temperature will drop and falafel won’t cook right). When done, place each batch on paper towels to drain; falafel cooks quickly so watch carefully to make sure they don’t burn.